Intense flavors distinguish a gourmet dinner from an ordinary meal. Carole Romatis, besides being the QuickBooks Guru at Accountants CPA Hartford, LLC, is also the Gourmet Accountant at our firm. It is Carole’s belief that accounting does not have to be a bland subject. Which is why we are always glad to discuss your accounting, QuickBooks, taxes, and business over a glass of wine, while enjoying a gourmet meal specially prepared by Carole Romatis, a true epicurean at heart. Let’s face it, tax season is long and arduous. And we have learned to survive this season of drudgery by eating well…every night! Tonight Carole served a very special client “Shrimp Magazine”. If you have never eaten Shrimp Magazine, frankly, you have never lived. This seafood dish is even decadent by New Orleans standards. 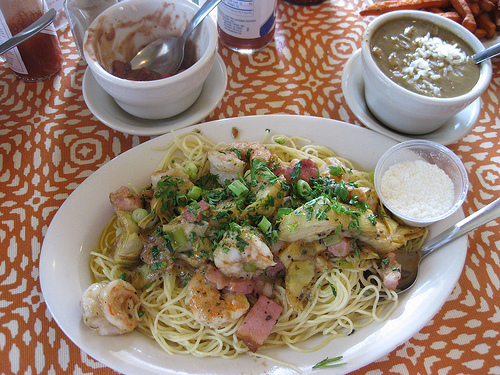 It is butterflied shrimp sauteed deliciously in a rich garlicky butter sauce with artichokes, ham, and green onions served over cappellini. The sauce is what makes the dish so tasty, but if you cannot handle the cholesterol, then suffer. But allow me to tempt you by providing its recipe so that, at least, you can enjoy it voyeuristically. Take three-quarter’s of a cup of flour. Season with kosher salt, black pepper, granulated garlic. Mix. Peel and butterfly a pound of extra large shrimp, and dredge in the seasoned flour. Add one stick of butter to a 10″ saute pan. Add the floured shrimp to the pan. Saute for a few minutes and then turn them over. Add a cup of chopped artichoke hearts and a half of a cup of diced ham. Then add a third of a cup of white wine, (2) tablespoons of Worchestershire sauce, and sprinkle with granulated garlic, black pepper, and kosher salt. Add (2) tablespoons of fresh chiffonade basil and (3) tablespoons of green onions. Add (2) cloves of minced garlic. Serve immediately over angel hair pasta. Sprinkle with parmigiano reggiano cheese freshly grated. Now allow us to ask you, does your present certified public accountant serve you a gourmet meal with a glass of vino while he or she reviews your financial statements or tax returns? No? C’est dommage. We do. ← Pachichetta: The Tastiest Meat Sauce for Pasta! Crusty French Bread: Sayonara my local bakery shop! Lobster Ravioli. Make your own dough for a real Italian taste. Shrimp Santorini: feta cheese, kalamata olives, and Greek seasoning add a sizzling taste to shrimp! Pasta alla Caprese: Simple but yet so Delicioso! My Father’s Chili Hot Dog Sauce Recipe and the Ultimate Nightmare Hot Dog! Pachichetta: The Tastiest Meat Sauce for Pasta! Welcome to My Website on Intense Tasting Recipes!